These procedures assume the operator is familiar with the use of the DSC. If further operation information is needed, please refer to the DSC User’s Manual. 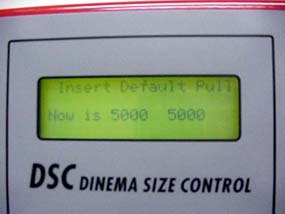 The procedures only apply to the Dinema DSC model Version 2 and Version 3 tested. Note that the following pictures are made from the version 2 model, but that all procedures are the same for version 3. Calibration of the DSC should be maintained on an annual basis by a qualified technician per Dinema. Use the supplied spring to verify that the machine is reading the same on a daily basis. Make sure that no garment is mounted on the DSC at either the cross stretch or length stretch position before powering it up. Have the sock fabric for each measurement as straight as possible. The DSC gives output readings in millimeters (mm) or in 1/4 (quarters) inches increments. The 1/4 inches increments were too wide to give statistically sound reading. Use the millimeters settings on the scale reading set up. 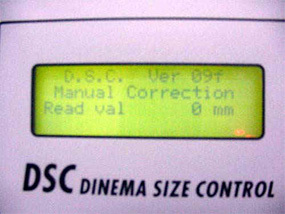 DSC Version 3 is capable of giving output reading in 1/16 inches. The pull weight should be set at 5000 grams. The scale reading must be set to mm. Make sure the machine is at the start position before loading the socks each time. Note: that the minimum relaxed length to measure for length is 5 ½ inches. 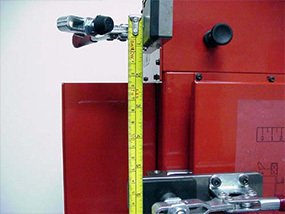 That is the distance between the length stretch clamps (Figure 4). 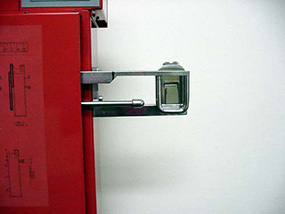 Optional needle clamps are available for sock length stretch from the distributor.